King Ethelbert, whose Frankish wife Bertha was a Christian, welcomed them. 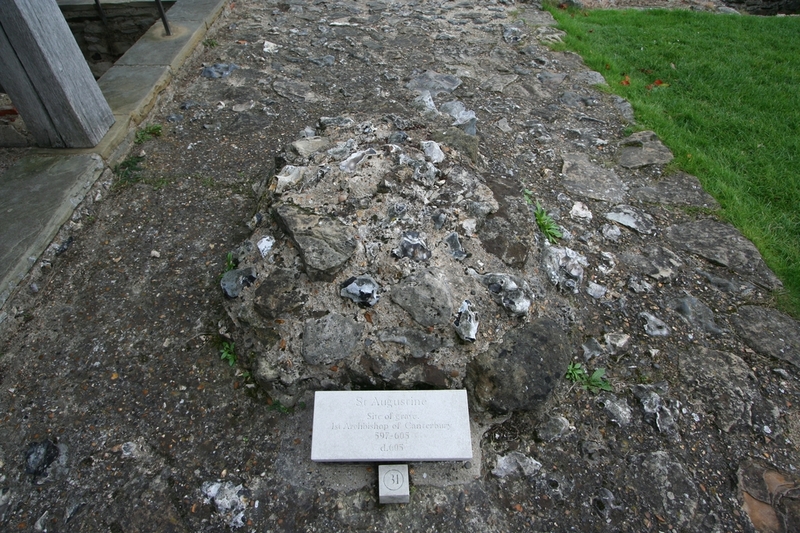 They were allowed to base their mission at the ancient church of Saint Martin in Canterbury, which was restored for their use. This church had been built during the Roman occupation of Britain, and the queen often went there to pray. At first, the king was reluctant to give up his pagan beliefs, but he promised not to harm them, and to supply them with whatever they needed. He also promised that he would not prevent them from preaching Christianity. Saint Augustine later converted the king to Christianity, along with thousands of his subjects. The Holy King Ethelbert is commemorated on February 25. 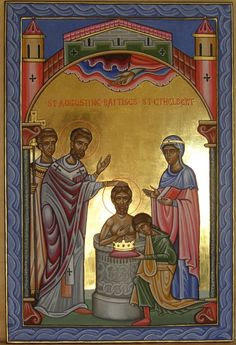 Venerable Bede in his Ecclesiastical History of the English Nation says that Saint Augustine was consecrated as Archbishop of Britain by Archbishop Etherius of Arles (others say that it was his successor Saint Virgilius of Arles [March 5] who consecrated Saint Augustine) in 597. Returning to Britain, he threw himself into the work of evangelizing the country with renewed zeal. A mass baptism of 10,000 people took place on Christmas day in 597. 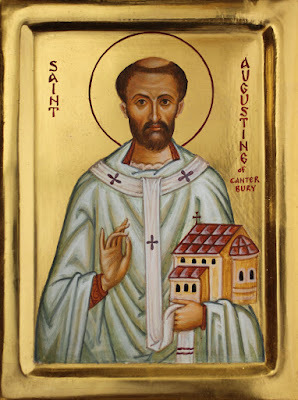 Saint Augustine built Christ Church, predecessor of the present cathedral at Canterbury, and consecrated it on June 9, 603 (according to the Anglo-Saxon Chronicle). He also founded the Monastery of Saints Peter and Paul east of the city. Here Saint Augustine, the Archbishops of Canterbury, and the Kings of Kent were buried. The monastery, now in ruins, was later known as Saint Augustine’s Monastery. The Saint was instrumental in founding the dioceses of Rochester and London. In 604 he consecrated Saint Justus (Nov. 10) and Saint Mellitus (Apr. 24) as bishops for those Sees. Saint Augustine also helped the king draft the earliest Anglo-Saxon laws, and founded a school in Canterbury. Archbishop Augustine was not completely successful in all his efforts, however. He was not able to achieve unity with the already existing Christian communities who followed Celtic practices. He met with some of their bishops to urge them to abandon their Celtic traditions and to accept the Roman practices. He invited them to cooperate with him in evangelizing the country, but they refused to give up their ancient traditions. Before meeting with Archibishop Augustine in 603, the Celtic bishops asked a holy hermit whether or not to accept Augustine as their leader. The hermit replied, “If he rises to greet you, then accept him. If he remains seated, then he is arrogant and unfit to be your leader, and you should reject him.” Unfortunately, Saint Augustine did not rise to greet them. Perhaps Saint Augustine was, to some degree, a bit tactless and too insistent on conformity to Roman customs. On the other hand, Celtic resentment against Roman authority also contributed to the stormy relationship. Known in his lifetime as a wonderworker, Saint Augustine fell asleep in the Lord on May 26, 604. He was laid to rest at the entrance of the unfinished church of Saints Peter and Paul. When the church was dedicated in 613, his holy relics were placed inside. An epitaph was composed for his tomb. In part, it reads: “Here lies the Lord Augustine, first Archbishop of Canterbury, sent here by blessed Gregory, bishop of the city of Rome, who with the help of God, and aided by miracles, guided King Ethelbert and his people from the worship of idols to the faith of Christ, and having ended the days of his office in peace, died the 26th day of May, in the reign of the same king." Saint Bede (May 27) gives detailed information about Saint Augustine’s mission to Britain in his Ecclesiastical History of the English Nation (Book I, 23-33; Book II, 1-3).